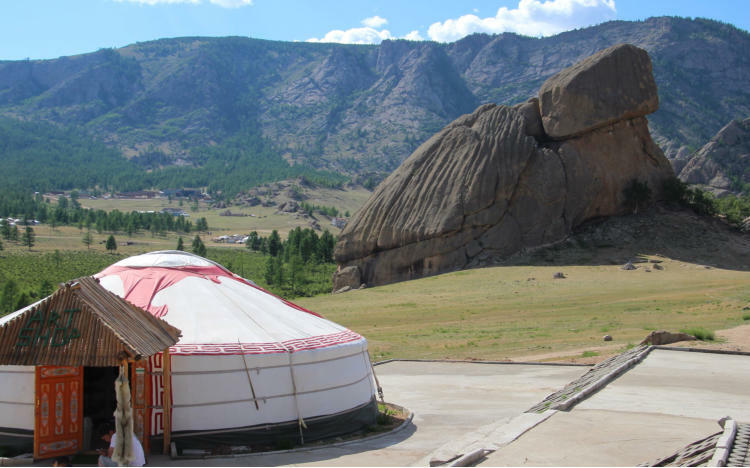 The third largest protected area in Mongolia, it covers an area of 2,864 square kilometres, and is characterised by undulating hills, interesting rock formations, a network of streams and rivers, and lush valleys inhabited by nomadic families. It is relatively close to Ulaanbaatar (about 80km) so is a busy tourist area. The symbol of the park, ‘Melkhii Khad’ is a 80 ft. tall granite forma - tion that is passed on the way to Aryabal Meditation Temple. Aryabal Meditation Temple was built in 1998-2004, because of its ‘Natural Energy’. It is located on a steep hill. The shape of temple is an elephants head and the set of 108 stairs leading up to the temple symbolize the elephant’s elongated trunk. Taking the path to reach the temple you pass signs of 108 translated works spoken by the Buddha,, cross the ‘Bridge of Heaven’ up the 108 stone stairs to the main temple where you see 108 small stupas and the 108 prayer wheels placed around the temple. We drove to the remarkable Chinggis statue at Tsonjin Boldog near Erdene, 54km east of Ulaanbaator. We went in a lift and then climbed up inside and along the exterior staircase which runs up the mane of the horse to a viewpoint overlooking the Tuul River, Terelj & the hills of Khan Khentii - Chinggis' homeland. It is on top of a visitor centre, itself 10 metres (33 ft) tall, with 36 columns representing the 36 khans from Genghis to Ligdan Khan. In the main hall is a huge replica of Chinggis Khan’s boot – the same size as the stainless steel boots on Chinggis’s feet. Built in 2008, for the 800th anniversary of the founding of the Mongol Empire, the Chinggis Khan Statue is built out of 250 tons of stainless steel, it is 40m tall (including the base) and depicts the renowned Mongolian leader on horseback, at the point where - according to legend - he found a golden whip and took it to mean that he was destined to become a great leader. The statue is symbolically pointed east towards his birthplace. It is currently the largest equestrial statue in the world. At his birth in 1162, the land of Tumüjin’s (Chinggis’s childhood name) childhood was occupied by numerous, often warring nomadic tribes. Part of Chinggis’s legacy is uniting these tribes under one rule and in the process creating a national identity for the Mongolian people. Chinggis Kahn proclaimed himself ruler of all who live in the cir - cular, felt-covered tents called gers that were the homes of these nomadic people, he was laying claim to the largest contiguous land mass ever to fall under one empire. At its height the Mon - golian Empire stretched from eastern Europe through much of China and Southeast Asia all the way to the shores of the Pacific Ocean. It was one of the largest Empires in history. Chinggis Khan died at the age of 65 in August, 1227.